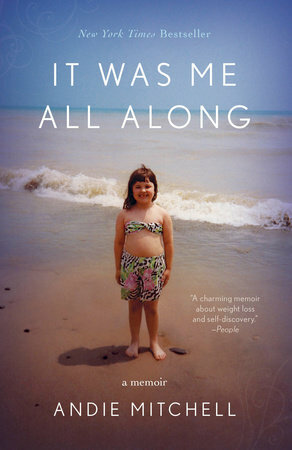 In her memoir It Was Me All Along*, blogger Andie Mitchell chronicles her life-long struggle with weight, body image, and her problematic relationship with food. Unlike most "blogger books," It Was Me All Along doesn't offer readers an airbrushed look into Mitchell's otherwise perfect life. On the contrary, Mitchell is candid about her struggles and the ongoing challenges she still faces. Like many of us, Mitchell had always had a troubled relationship with food. Even in childhood, Mitchell would binge to help assuage her feelings of sadness and loneliness. As she got only, Mitchell's weight ballooned until the summer after her second year of college when, through diet and exercise, she began to loose weight. Yet, even after she reached, and surpassed, her goal weight Mitchell's struggles with food and body image did not end. Rather, the pressure of keeping the weight off and maintaining a balance between eating right and exercising became an all-encompassing obsession for Mitchell. In this memoir she details how she was able to get past these darkest periods during her weight loss journey-- both medical and non--and what steps help her get her life back on track. At the end of the book, you're left with the sense that though she has successfully dropped the weight and has built a successful career as a food writer, Mitchell still must mediate her relationship with food. I cannot stress how refreshing this point of view is. So many times, memoirs seem to espouse the idea that everything is "okay now," but Mitchell avoids this pitfall. Rather, she offers her readers are more hopeful, attainable end point: it can get better. It Was Me All Along was an enjoyable read, though one I cannot see myself reading again in the future. If you enjoy reading memoirs or are struggling with weight or food issues of your own, I highly recommend this book. *This book was sent to me by the publisher through Blogging for Books for review consideration. The thoughts and opinion expressed in this review are my own and I have not been financially compensated for this review.